I chose to review the white non unibody 13” MacBook battery, because I had a suitable MacBook, now used by my daughter, in need of a replacement battery. I am confident that what applies to the battery I reviewed will apply across the board to all of their other batteries. I admit that I have, in the past, purchased a cheap, no brand, pattern part, battery for a similar MacBook on the basis of price. That turned out to not be a great investment. I will make occasional comparisons along the way between my experience with this NuPower battery and the cheap copy where I think it seems appropriate. 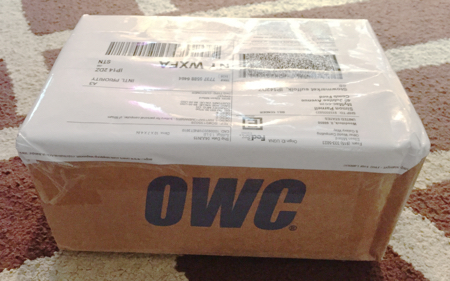 The battery arrived well packaged in a quite large box from Other World Computing, who are Newertech’s preferred reseller. It was filled mostly with those big plastic air pillows to prevent the rather smaller Newertech box from rattling around. The NuPower battery box was itself a fairly sturdy piece, made with doubled over corrugated card walls and a tab fixture lid. Inside the battery itself lay in a plastic tray, cradled in a cardboard holding frame, and protected from scuffs by both a thin sheet of that strange spongy foam material and the now almost ubiquitous anti scratch plastic film. In comparison the cheap pattern one came in a basic polythene bag. The NuPower battery was clearly very well made and compared favourably with the original Apple one. It was a good match in colour and apparent materials. The rubber foot and the button to work the LED indicator were almost identical to the Apple original in appearance. As you can see in the photographs, it is clearly labelled and nicely made. It even came with a small note pointing out that there is a printing error that refers to it as a battery for a MacBook Pro, and that this mistake would be rectified on the next manufacturing run (I mention this only because the chances are if they hadn’t told me I probably wouldn’t have noticed it). Looking at the picture at the top of this post you can see that mistake has now been rectified. The cheap pattern one I bought previously was not a great match for colour. It was close, but not exact, and the plastic part didn’t appear to be the same quality of polycarbonate as the original. Also the rubber foot on the cheap one was definitely not a good match. 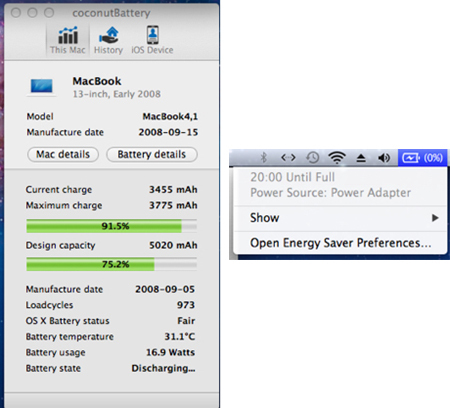 As you can see from the screenshots the old MacBook’s original battery had taken a good seven years of what I would call average usage. That 973 charge cycles in 7 years is about 11.5 charges a week, and the battery is still reporting that it is at 75% of original capacity! That is fairly good going. However this is where the numbers don’t tell it all. For quite some time the old battery had only been able to cope with powering the laptop for maybe an hour and by this point you were lucky to get 45 minutes on the battery. Also the charge time to discharge time had become seriously disproportionate. It didn’t actually take 20 hours to charge as that initial assessment says, but it took a long time. Maybe seven or so hours; less if the MacBook was actually off. 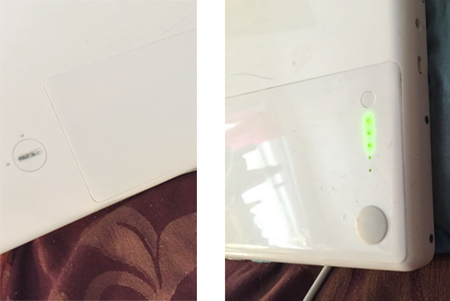 So most of the time the laptop was running on the AC power with the battery only really being used to power it for either very short uses, or to prevent the Mac turning off if someone tugged out the MagSafe. So this is the acid test: what sort of performance are we going to get from the NuPower Battery? The battery arrived with about a 70% charge so I decided not to take a screen shot immediately but to let my daughter put in the new battery and use it a bit. I wanted my daughter to run it down then to recharge it and take a measurement then. Here are the results. Now that is what I call an improvement! Note that the NuPower battery is approximately 10% higher capacity than the originally fitted one. Whether there is a capacity increase with a replacement NuPower Battery will depend on your model. In general, the older the Mac the replacement battery is for, the more likely it is there will be an increase over the original, and also the larger that increase is likely to be. This I have to assume is purely due to the improvement in battery technology over the last few years. That charge time was pretty accurate and the MacBook seemed to be able to get a reasonable run time from the battery. Not always as long as the Finder estimated, but in my experience that has never been the case. As my daughter’s usage tends to involve running YouTube or iTunes/Spotify in one window whilst using Skype or some other IM/messaging client in another and browsing FaceBook or Flickr in a third I would say getting around two hours on a battery charge wasn’t bad for that old Mac. I don’t recall getting much better than about two and a half hours from it even when it was new. I am also sure that my more moderate usage, mainly browsing and writing, emailing and perhaps a messaging client might get a bit more from the battery than my daughter’s. In comparison, the cheap pattern battery I bought in the past was half the price of the NuPower and half the performance or less. It too would take about one and a half to two hours to charge but never really managed to last more than an hour or so when called on to power the laptop. You get what you pay for. This battery is really well made. It was an excellent fit and finish. It performed excellently, returning the seven year old machine to like new, at least in the battery life department. I can only comment directly on this battery, but I have no doubt that every battery Newertech ship in this product lineup is of equal quality and build. 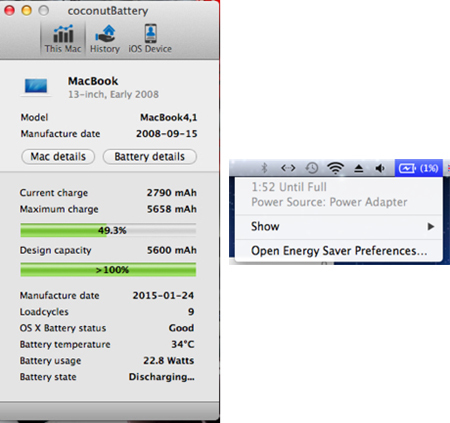 I would recommend NuPower if you have a Mac with a tired battery and are looking to replace it. I really can’t find anything on which to fault the one I received. 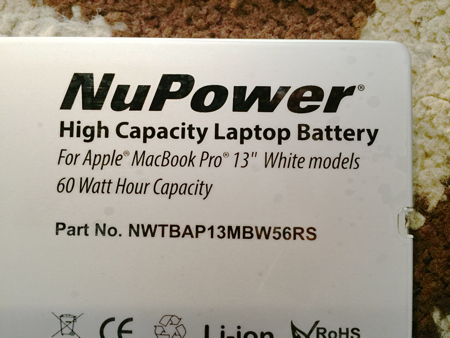 I happily give the Newertech Nupower Mac Notebook Battery a MyMac rating of 9 out of 10.